Hale Leys United suffered a rare blip at the weekend when they were held to a goalless draw by SSML Division Two’s bottom side The 61FC Luton. 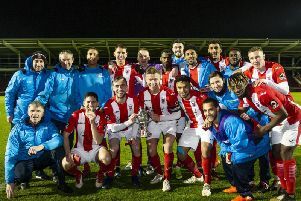 Hale had a number of key players missing, including Nathan Grama, Anthony Kew and Daniel Parsons, and they were hampered further when Unas Ilyas was forced off. Nevertheless, United should have had enough quality to beat a side who have won just twice this season, however Luton frustrated their visitors and it wasn’t meant to be. That now means Hale’s lead at the top of Division Two is now eight points over Kent Athletic, who have four games in hand. Hale manager Paul Alleyne said: “We came here and knew it wouldn’t be easy because we did struggle with some players missing but I did believe we had enough depth in the squad to get something from the game. “The pitch wasn’t the best and we did struggle but Luton were set up for a draw and when a team does not want to play football it makes it very difficult to break them down and play but we got a point so we shall move on. Hale Leys are again in league action this weekend against local side Grendon Rangers. Kick-off is 2pm at Fairford Leys.